The purpose of these blog posts has been to get information out there, over the internet to help someone who may be in search of this Henry Bryan. He served with the 37th Regiment of the U.S.C.T. Vols. 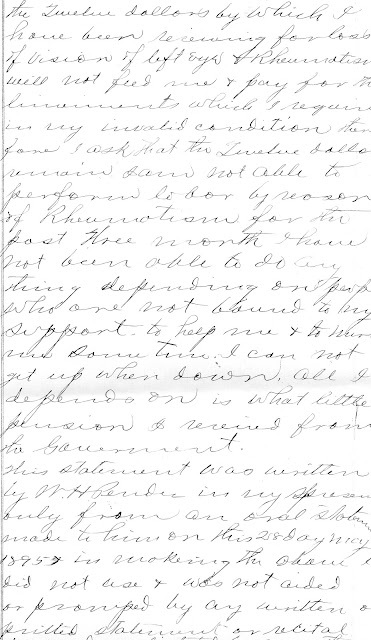 In this segment, we learn that Henry's condition has continued to deteriorate over time and even worse, his pension which he had been receiving for $12 per month was due to be reduced to $8 per month as of May 4, 1895, unless he could prove his case. 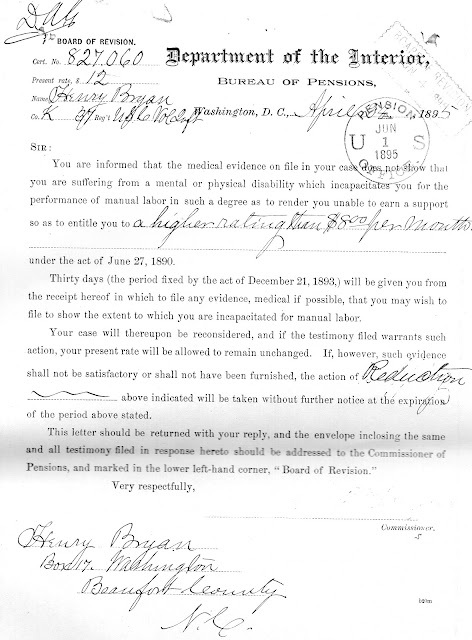 You are informed that the medical evidence on file in your case does not show that you are suffering from a mental or physical disability which incapacitates you for performance of manual labor in such a degree as to render you unable to earn a support so as to entitle you to a higher rating than $8.00 per month under the act of June 27, 1890. 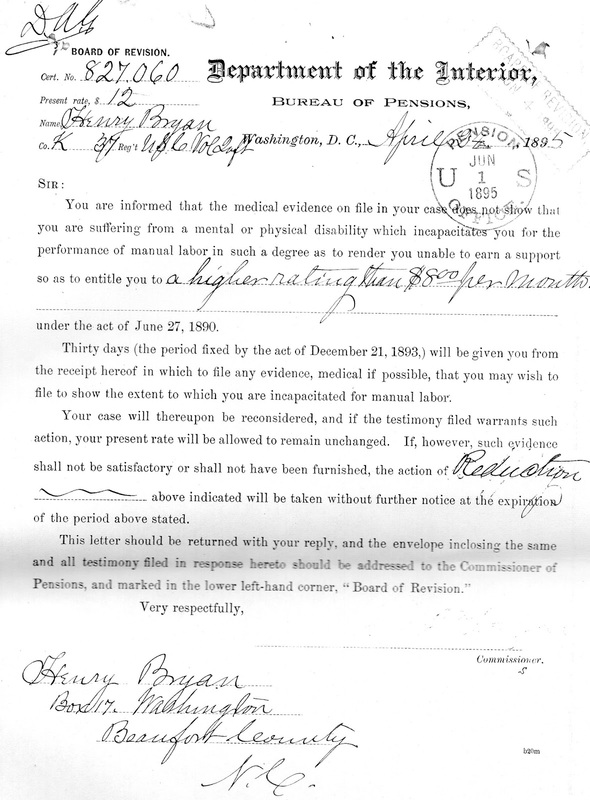 Thirty days (the period fixed by the act of December 21, 1893,) will be given you from the receipt hereof in which to file any evidence, medical if possible, that you may wish to file to show the extent to which you are incapacitated for manual labor. Your case will thereupon be reconsidered, and if the testimony filed warrants such action, your present rate will be allowed to remain unchanged. If, however, such evidence shall not be satisfactory or shall not have been furnished, the action of Reduction above indicated will be taken without further notice at the expiration of the period above stated. This letter should be returned with your reply, and the envelope inclosing the same and all testimony filed in response hereto should be addressed to the Commissioner of Pensions, and marked in the lower left-hand corner, "Board of Revision." Wow, ain't that something! You serve, continue to get older and your medical conditions get worse and so I guess you won't be needing as much money to take care of yourself now. Have a nice day. Man, I would have had a few choice words to say. Henry Bryan apparently, tried to provide evidence that his conditions were serious and he needed his pension to remain at the rate of $12/month. 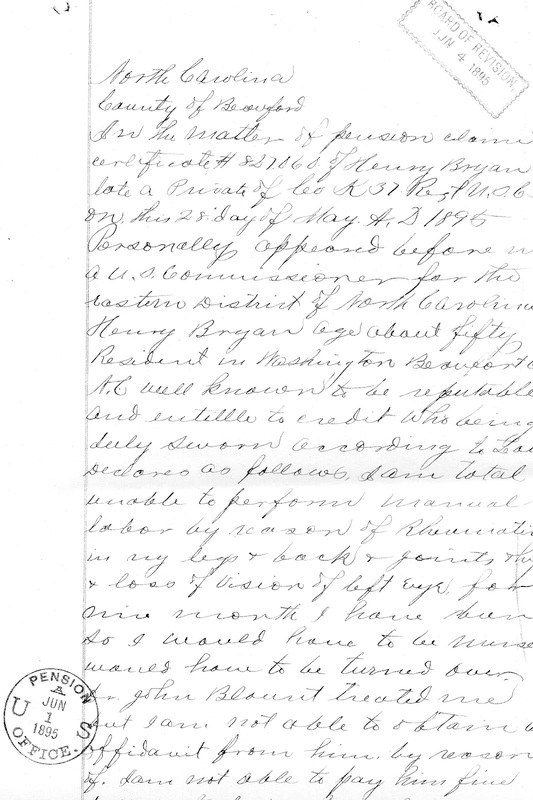 Here is his testimony that was received by the U.S. Pension office it looks like on June 1st and reviewed at the Board of Revision on June 4, 1895. In the matter of pension claim certificate # 827.060 of Henry Bryan late a Private of Co. K 37 Regt U.S.C.T. on this 28 day of May A.D. 1895.
the twelve dollars by which I have been receiving for loss of vision of left eye & rheumatism will not feed me & pay for the liniments which I require in my invalid condition therefore I ask that the twelve dollars remain. I am not able to perform labor by reason of Rheumatism for the past three month I have not been able to do any thing depending on people who are not bound to my support to keep me & to nurse me some time. I can not get up when down. All I depends on is what little pension I received from the Government. an (word?) to this my testimony my Rr is Washington N.C. 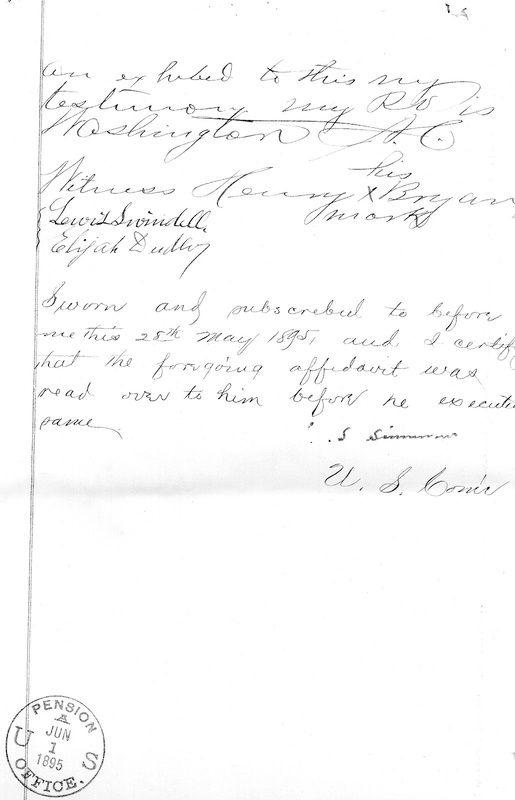 Sworn and subscribed to before me this 28th May 1895, and I certify that the foregoing affidavit was read over to him before he executed same. 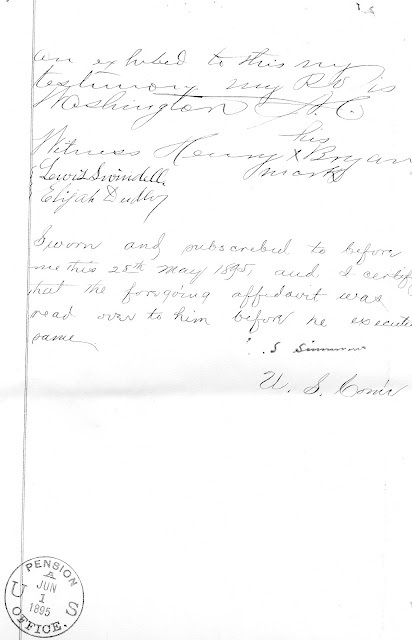 The testimonies of George H. Wilder and Lewis Swindell, I will post next Monday as well as what the Board of Revision decided. amazing post on this blog.